Price and Where to Buy: $28 to $30 (with shipping), available on Cozy-Cover.com and Amazon. Pros: This is the smallest, lightest high-chair option imaginable. It’s cloth and comes with its own stuff sack, so it’s possible to have this in a diaper bag as back-up when you find yourself somewhere without a high chair. Think of it as the alternative to holding your child on your lap while feeding him or her, and then think of how much cleaner your clothes will be at the end of the meal. Cons: Because it’s basically a harness that attaches to a chair, a lot depends on the sturdiness of the chair at hand. Since it’s not actually a high chair, there’s no tray (which some babies really like as a Cheerio-chasing surface), and it doesn’t boost them up to the height of the table—this absence of baby-friendly diversion options means that the child may not be willing to sit for as long as they might in a taller chair with a surface. Usefulness: 8/10 When you’re out and about and without a high-chair option, you’ll be glad to have this. 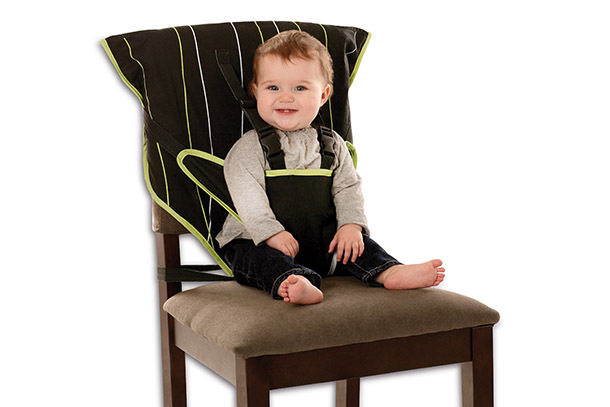 This could potentially also be used to help secure a slightly older child (up to 35 pounds) learning to sit in a chair, giving the Cozy Cover a whole second life. Value: 8/10., At under $30, it’s less expensive than other travel high chairs, and it’s so easy to stash in a diaper bag and have right when you need it that it almost earns its keep by peace-of-mind alone. Durability: 8/10. The Cozy Cover seems relatively well-made and well-structured. Although I wouldn’t leave a baby unattended in it, I felt confident that my baby tester (nine months old, very wiggly) was secure in it. Final Verdict: I’m always on the lookout for items that make traveling with babies and small children easier, and the Cozy Cover fills a niche that caregivers who don’t want to travel with a clunky hook-on high-chair or folding booster seat can simply toss in a diaper bag or a purse. And while it’s not a substitute for a high chair, it is a useful backup when you don’t feel like ending up covered in food while trying to feed a small human balanced on your lap.